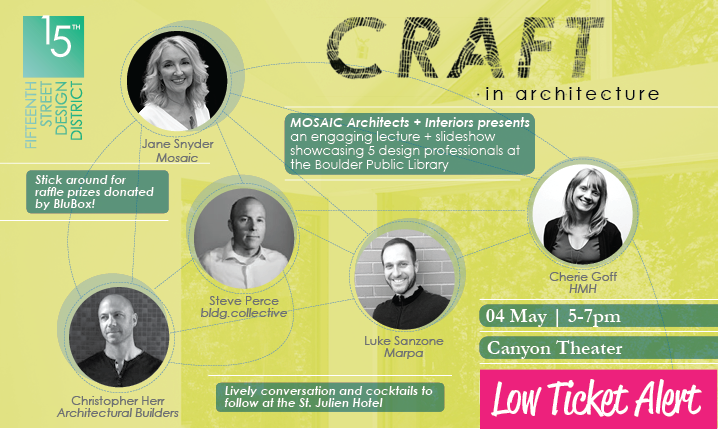 CRAFT IN ARCHITECTURE_A Visual Presentation at the Boulder Public Library will feature 5 Boulder professionals from the fields of architecture, landscape design, and construction. We will explore architecture through the lens of craft to study the design process, the tools used in design and construction and the nature of built spaces. How do you translate an idea through various scales? How does your hand or your computer impact your design? How do the construction tools and methods affect the outcome? How do the materials affect the quality of space and experience? Following the presentation, please join us at the St. Julien Hotel (right across the street!) for cocktails and nibbles. We’ll be sharing ideas, shaping the future and strengthening our design community. All are welcome.